Mathematicians at The Grammar School at Leeds (GSAL) have made a strong start in this year’s series of student challenges set by the United Kingdom Mathematics Trust (UKMT). The results are in for the Maths Olympiad for Girls (MOG) which, with only 1745 students sitting the exam across the whole country, is designed for the most able female mathematicians in Year 11 and above. The challenge aims to inspire as many girls as possible to get involved in advanced mathematical problem solving. The UKMT works to enhance maths learning in school by organising national competitions and enrichment activities for secondary school pupils. GSAL students from Year 7 to sixth form take part in the individual and team challenges. In this year’s MOG exam the mean mark was 10 and those achieving 14+ were awarded distinction. 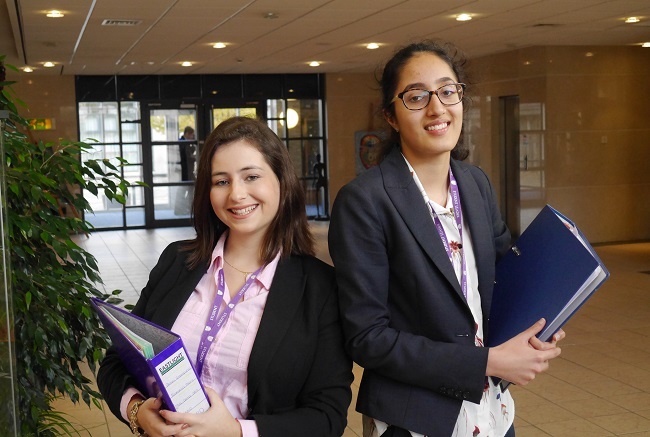 Two GSAL candidates earned distinction, Tamanna Dasanjh, Year 13, with the school’s highest score of 29, and Jenni Greenfield, Year 12, with a score of 22. Both girls were keen to have a go at this challenge which is a 2½ hour exam consisting of five complex mathematical problems for which full written solutions are required. This is in contrast to the multiple choice format of many of the UKMT maths challenges which they had sat previously. Congratulations are also due to Abbie MacLeod and Manasvi Tyagi, Year 12, and Molly Lodge and Golasa Sheikh Akbari, Year 13, who achieved certificates of participation.